The images from the Neil A. Lieb Archive are the best historical, phase-by-phase photos that I’ve seen yet. They give the layman a good concept of what actually takes place, from start to finish, in building a grain elevator. Excavating the foundation began with a bang. Neil writes about the use of dynamite during the excavation process. Dynamite was used for foundation excavation on many a job because of the deep frost. We even used it for cutting the foundation of the reinforced concrete garage we built on the old place in Omaha. We were young ’ns then, but still got to set (light) the fuses to a few charges. I remember getting the neighbors excited about what the hell we were doin’ now. By the way, the garage utilized slip-form construction with steel stays instead of wood for the formwork—another of Dad’s experiments. He was interested in finding materials that could be reused over and over, rather than having to buy lumber formwork for every new job. I guess this method didn’t make a lot of sense, as he never tried it out on an elevator. This photo is an historical testimony as to how the so-called unskilled, common man could be taught layout along with measuring, wood cutting, and other carpentry skills. 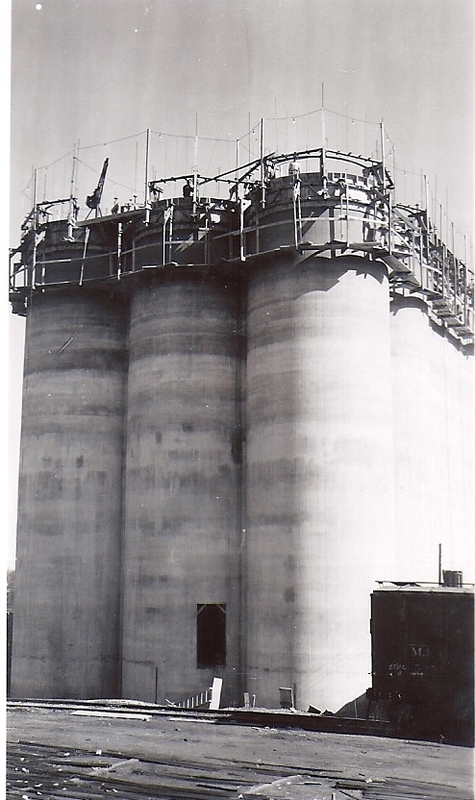 The labor used to build these forms and construct the entire grain elevator structure was obtained, for the most part, from the inhabitants of the local vicinity where the elevator was to be built. Most of the workmen had no experience whatsoever in the construction industry. 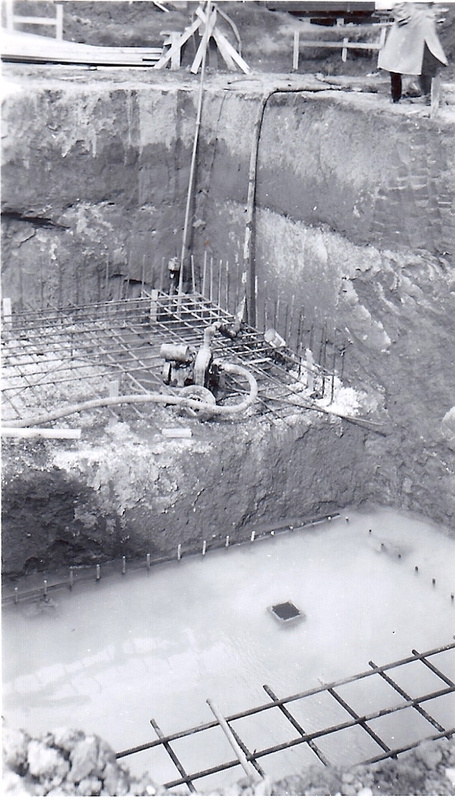 People used to marvel at how the cement went into the top of the formwork and came out the bottom of the forms, in a set-up, semi-solid state, all occurring whilst the deck and forms continued to extend upwards, being jacked up on screw jacks. Once the slipping of the forms began, it never stopped, unless by a power outage, a severe storm, or some other interference. Beneath the deck and main formwork, a sub-scaffolding was constructed to provide access to the exterior face of the concrete structure, which required patching and touch-up for a final smooth finish. A rich mixture of cement, sand, and lime was used which was applied to the concrete face by hand, usually covering the entire exterior surface, removing all blemishes. The finish material was hoisted in five-gallon buckets to the finishers. 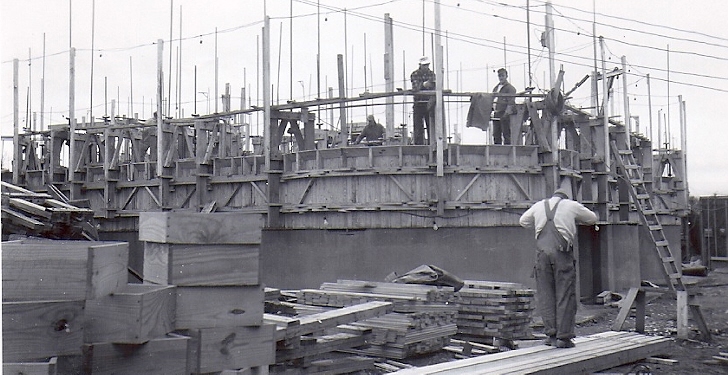 These workmen traversed the scaffold of wood planking—usually two, 2 x 12s laid flat between the wooden hanger frames that attached to the formwork above. Very dangerous work without a safety net! At the ground level, a workman on a tractor would load a Georgia buggy with cement, to be hoisted to the top and placed in the formwork. Small skip loaders, tractors with scoop-type buckets mounted on the front, were an essential tool used during construction. This included scooping up the sand, gravel, and cement to make concrete and placing them in a mixer. 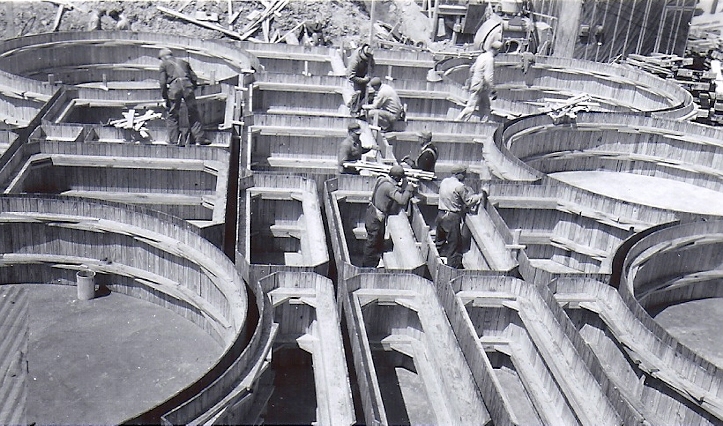 Once the concrete was ready for placement, the tractor scoop was filled with the cementitous mixture and transported to the side of the elevator whereby the tractor would dump its load into a Georgia buggy to be hoisted up to the deck for placement. 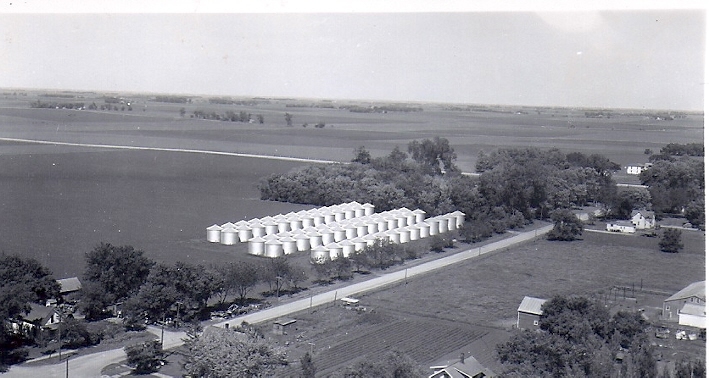 The logistics of material supply was always challenging for the grain elevator builder. Usually, the projects were located in very rural farmland areas, where the supply of lumber, steel, sand, gravel, cement, gasoline, and oil was miles from the site. Because the construction utilized the slip-form method, the operation never stopped once it began, making it paramount that the supply of materials be established beforehand along with a comfort level that there would be no interruption once the job started. Neil has noted (in an as yet unpublished commentary) the mixture of the gleaming, white, finished “paint,” which wasn’t really paint at all but instead a cementitious mixture that lasted for a very long time. Some of the elevators existing today still boast the original finish. Tillotson was among the few contractors that finished out their jobs this way. 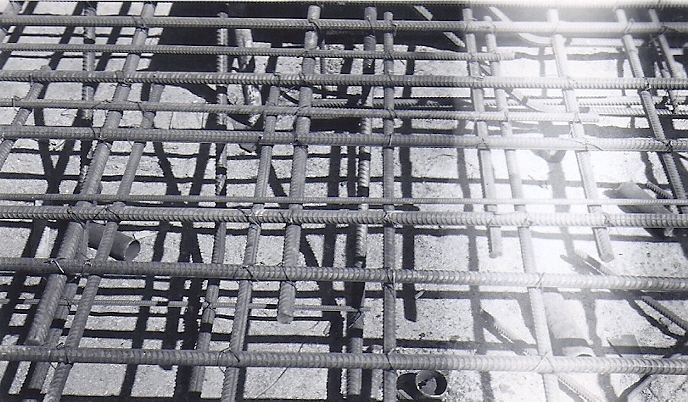 Training the local unskilled labor in the processes of placing and wire-tying the reinforcing steel –and of pouring concrete, turning screw jacks, keeping the slip-form deck level, et cetera– were just a few of the many headaches the job superintendent had to bear during the initial start-up phases. 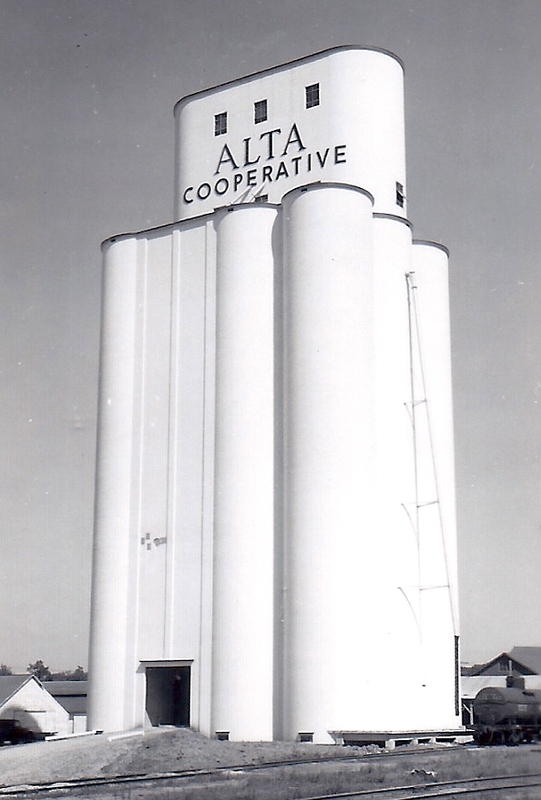 This entry was posted in Charles J. Tillotson, Employees, Photography, Their Work, Tillotson Construction Company and tagged Alta Iowa, architecture, Business, construction, grain elevator, photography, slip-formed concrete, Tillotson Construction. I find it incredible these structures were built by men in the locale… who were given on-the-clock training! But having been a mechanic in my youth (translate that to decades ago), I also found it eye-opening to see how many tractors were required to finish a job. I can’t imagine that going on today. I agree with Mustang,Kojl. I wonder how many of the local men once trained traveled to other sites to complete grain elevators. It was a tech school without tuition rather on the job training that one would be paid for… imagine that! I’m a big believer in tech schools rather than graduating after four or five years with a large college loan and degree where jobs are scare and difficult to find. Training men and women in trades they are passionate about and I suppose some who just know they’ll learn a craft that will bring in an income. Several of my good friends have made a living by these like style means.The best man in my wedding, Bill, had a neighbor who owned a heating and air conditioning service and no family member to carry on the business. Bill would work for his neighbor every summer and after high school worked full time for him. Bill eventually was generously given the practice when his neighbor desired to retire. They had become family through the years. Bill raised his family of seven along with training several employees who continue to provide a great service while supporting their families. A “dear neighbor” program that is still active today in many trades! Thanks Ronald and Papa, aka Charles J. Tillotson, for this interesting information. Though the nuts and bolts are screws and cement get a bit too technical for me I enjoy the Tillotson history thoroughly!